Dato’ Azhar bin Abdul Hamid was appointed to the Board of Terengganu Inc. as a Director on 6 December 2016. He began his career in public service as the Magistrate in the Magistrate Court Temerloh, Pahang in 1989 and rose through the ranks to become a Deputy Public Prosecutor with the Kuala Lumpur Prosecution Unit and Commercial Crime Unit in Putrajaya. Following his experience, he was appointed as the Deputy Public Prosecutor, Head of Kedah Prosecution Unit and Head of Penang Prosecution Unit in 2004 and 2007 respectively. Dato’ Azhar is presently the State Legal Advisor for Terengganu, a position he has held since 2014. Prior to holding this post, he was the Special Legal Officer for various ministers in the Prime Minister’s Department. 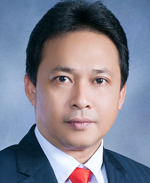 Dato’ Azhar holds a Degree in Law from the International Islamic University Malaysia. .